A peninsula is a region of land that sticks out in a body of water. 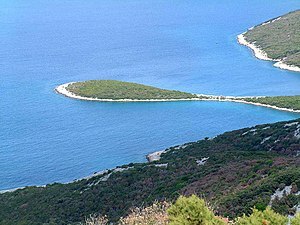 It is also defined as a piece of land with water on three sides. Many countries are found on peninsulas, and may either take up part of a peninsula (such as Korea) or all of it (such as India). Parts of a country may also be on a peninsula. For example, most of the U.S. state of Florida is a peninsula, along with Baja California in Mexico. If Eurasia is considered a continent then the continent of Europe is technically a peninsula. If this is the case, the three peninsulas of Europe, the Iberian, Italian, and Balkan peninsulas would technically be peninsulas within peninsulas. The area of the European Peninsula, comprised of Europe minus Russia, Scandinavia, and any islands, is roughly 4.4 million square kilometers. The Arabian Peninsula is usually cited as the largest peninsula in the world with an area of 3,237,500 square kilometers. This page was last changed on 7 February 2019, at 15:34.